We woke up to alpine glow on the mountains above our majestic campsite. It was a cold morning with frost covering the tundra around us. We packed up, put on our wet shoes and got moving in an attempt to stay warm. Of course having a cold creek to ford at 6:45 am is always fun too. There was a log that crossed the creek, but it was at least 6 feet above a raging part of the water. A fall from that log would have been nightmarish. Therefore we opted to just ford the creek in our already wet shoes. 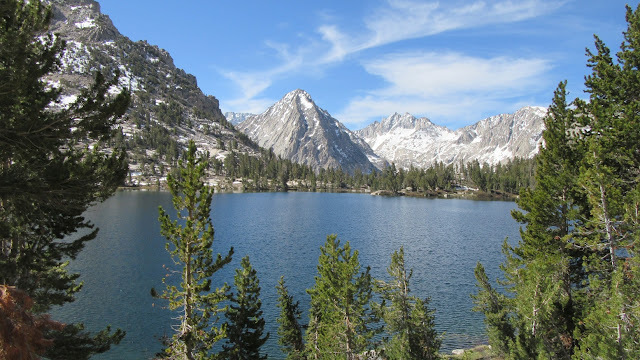 Walking towards the junction of the PCT and the trail to Kearsarge Pass was incredibly scenic. 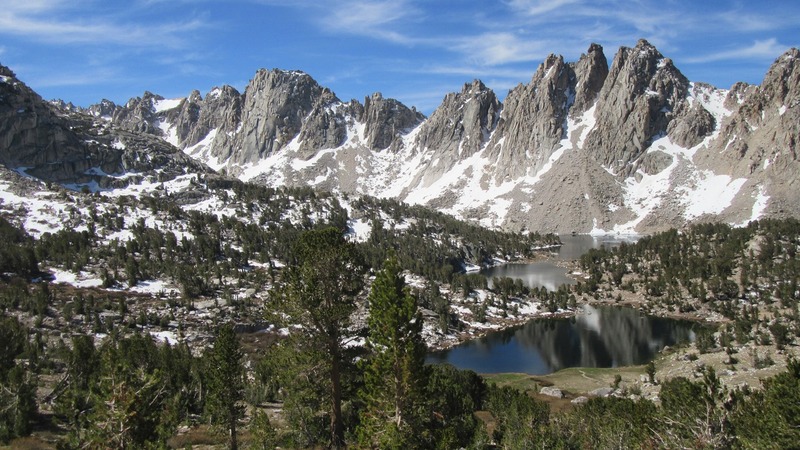 Towers of granite protruded above the pines which rose from the valley floor. Sunlight illuminated the rock and reflected off the water of the loud creek that paralleled the trail. At the turn off to Kearsarge Pass the trail steepened sharply. The hike up was slow and arduous. I had less than 1000 calories off food to last me this hike out to town and I was feeling sluggish. Bullfrog Lake was the first of a few stunningly clear lakes we passed today. As we gained elevation, more lakes and waterfalls would appear. The beauty of this place is really difficult to capture. We ran into Gandalf near the top of Kearsarge Pass and exchanged a few words. 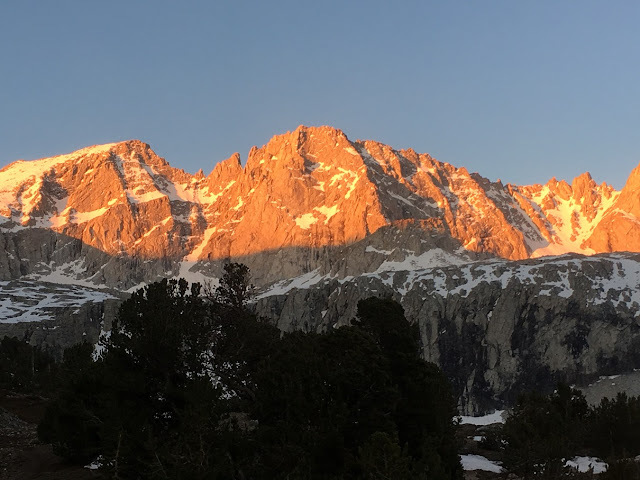 He had just resupplied and was heading back to the PCT. 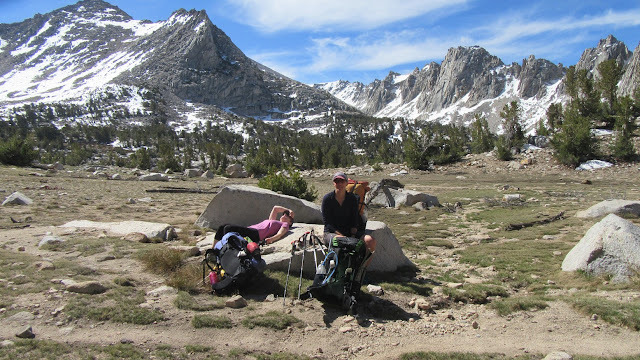 When we reached the top of the pass, I took my pack off and scrambled up some rocks. On the top, I found a ceramic plaque left on a large boulder on the top. Briefly I pondered why this spot was so special to the person mentioned on the plaque and/or the person that left it up there. After climbing down from the rocks, Ziploc and Kate told me about a guy we’d seen twice that morning. He was carrying a garden hose strapped to the back of his pack. The ladies asked him out of curiosity why he was carrying it. The girls struggled to control their laughter when hearing this and as the guy walked off laughter erupted. 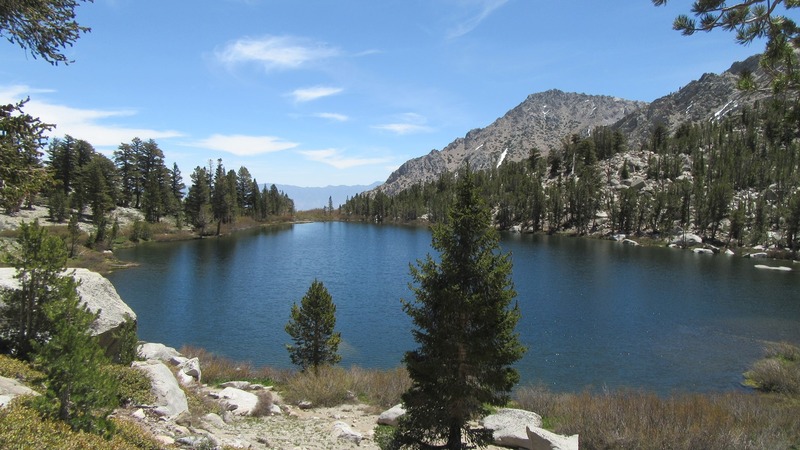 From Kearsarge Pass to the Onion Valley trail head was four beautiful miles. More scenic lakes framed by snow-capped peaks, waterfalls, and trickling streams. At one of the bigger lakes, I arrived to find Ziploc and Kate with their packs off filtering some water. 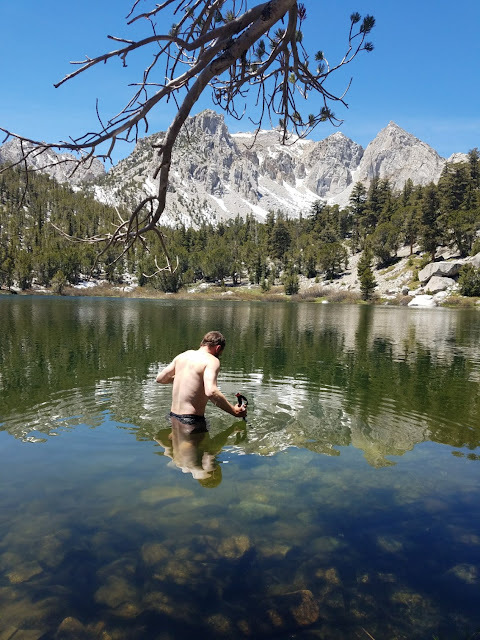 It was very hot, so I dropped my pack, took off my shirt, and went for a swim. The water was very cold albeit refreshing. I was only in for 20 seconds and then got out and back into the sun to warm up. I then realized I was missing the sunglasses that had been on top of my head. The three of us walked back to the spot where I’d went swimming. From the shore, I could see my sunglasses about 10 feet out and 5 feet down. I waded out using trekking poles for balance on the slick rocks. With trout swimming around my legs I lifted my sunglasses from the floor of the lake with my toes. With my second swim complete, we all raced down the trail to the trail head with thoughts of showers and food circling our heads. When we arrived at the trail head, it was a ghost town; only a couple other thru hikers sitting in one tiny patch of shade. It was 98 degrees. We started walking Onion Valley Road which is over twelve miles into town. 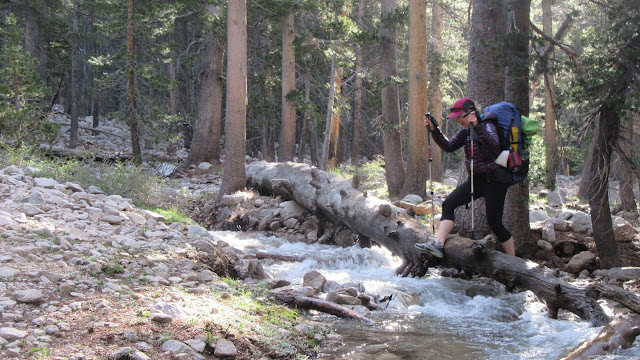 I walked ahead of the girls who had stopped where they had a cell signal to try to contact a trail angel for a ride. I walked for three miles and only one car had driven by and it had been full with the other hikers we’d seen. I rested in the shade of a single pine tree in the hot and desert terrain. To my surprise, a car rounded the hairpin turn above me and pulled over. Ziploc and Kate were already inside and a wonderful woman who had been day hiking picked me up also. She drove us to the town of Independence where Kate and I had both mailed resupply packages. After hitting the post office, we walked across the scorching street to a gas station where I was disappointed to find that they were sold out of soda. My dreams of a cold Mt. Dew dashed in an instant. I settled for a bag of chili cheese Fritos and a Gatorade. 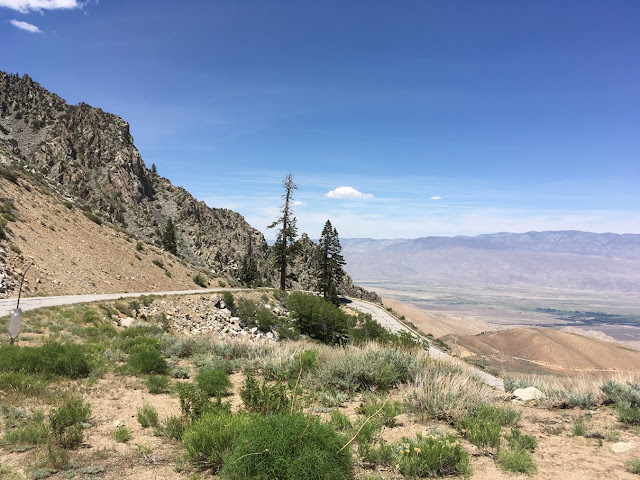 We decided the town of Independence sucked, so we hitched to Lone Pine. We got a ride within two minutes from a great guy named Cameron. He was so awesome that even after driving past the hostel we were going to, he turned around and drove us back. Kindness like this is a rare quality in a person these days. We checked in, showered, did laundry across the street, and made some phone calls. I talked with my daughter who’s taking a few classes at college this summer. It was great to hear her voice. I miss her so much. We ate dinner at a great Chinese restaurant where we dined with an elderly couple who’d also been waiting for a table. The five of us shared a table for six. During dinner we got to know Jim and Eve. Hiker hunger was in full effect for me. Before dinner, I had drank a 32 oz. double IPA, ate a banana and 7 double stuff Oreos. At dinner, I ate a plate of fried wontons and a family portion of Kung Pao. When I was done eating, Kate offered me the rest of her dinner which she couldn’t finish. I inhaled that too. After leaving the restaurant, we walked to the store and bought ice cream sandwiches. Tomorrow we’re going eat as much as humanly possible and then try to get back up to that remote trail head somehow. 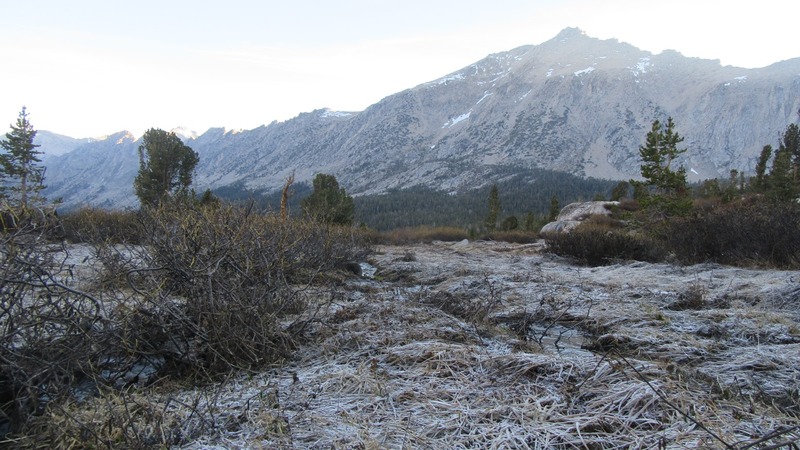 We’ll continue our hike in the Sierra and push onward to our next resupply in about 90 miles or so. Glad you guys got a good meal! Thanks for keeping me company for a few miles. Looking forward to following the rest of your progress!